As part of Lamborghini Squadra Corse, Lamborghini Accademia is the step between the highly successful Lamborghini Esperienza and Lamborghini Blancpain Super Trofeo programmes. Accademia creates the perfect opportunity for Lamborghini enthusiasts to progress beyond learning how to drive a Lamborghini on track and truly enhance and develop their skills as a performance driver, while surrounded by the best trackside hospitality in the automotive industry. The inaugural North American event took place in September in Monterey, California—with the bulls taking to the famed turns at the historic Laguna Seca Raceway. As the first two-day Lamborghini track event, guests were greeted upon their arrival at a luxurious hotel in downtown Monterey, hosted for a fabulous welcome dinner with their instructors and Lamborghini executives, given gift cards to spend at the trackside Lamborghini store, and then there was the driving…. This program took prior track events to a whole new level with smaller group sizes, new exercises, and in-car telemetry—the same-day professional analysis allowed drivers to learn and improve their skills before departing. 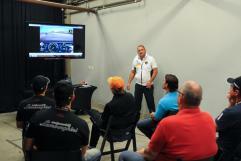 Over the course of three sessions, about 70 owners and enthusiasts completed Accademia Laguna Seca. Centigrade developed a holistic management strategy for this event from the initial planning phases to the final guest departure. By creating a promotional outreach strategy that mixed print, digital, media, and dealership communications, we were able to execute a delivery that was not only on budget and schedule for our client, but perfectly captured the Lamborghini brand. By creating a world-class experiential event for the participants both on and off the track, Centigrade managed to solidly place Lamborghini Accademia at the top among all track driving and automotive lifestyle programs in the industry.